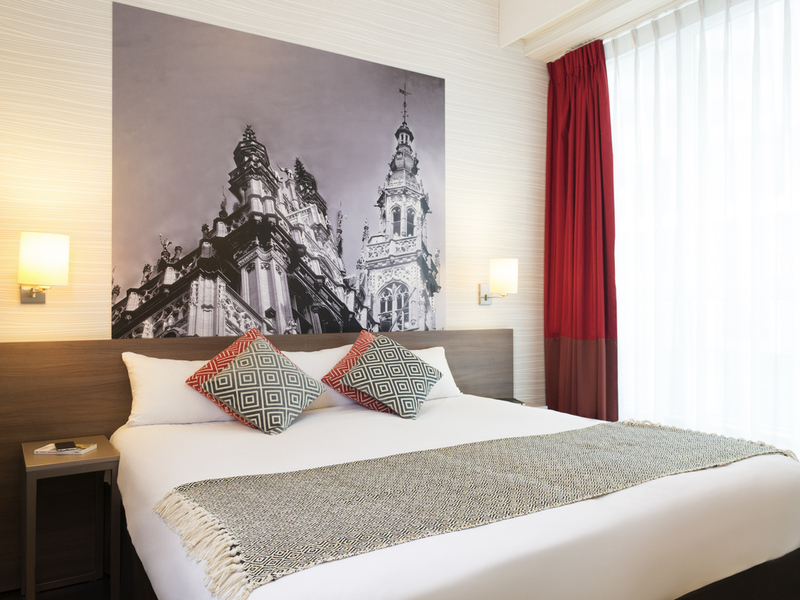 Feel welcome at Aparthotel Adagio Brussels Grand Place. With your own kitchen in your apartment, you have all the freedom you need to explore Brussels. There is a free gym for hotel guests, public paid parking facilities and free WIFI. Various tourist hotspots of Brussels are within walking distance from our hotel . There is, for example, Manneken Pis, St Michael and St Gudula Cathedral, MOOF Museum, Mont des Arts and Sint-Katelijneplein. We can also recommend a visit to the Margritte Museum, the iconic Atomium and Autoworld. Go for a leisurely walk through Warande Park or indulge in some shopping on the Grand Place. Don't forget to check out the Grote Zavel antiques district. Your home away from home. Enjoy our modern studios for two people and appartments for four people. The accommodations include a fully equiped kitchen, flat screen TV, bathroom with bathtub, individual safe and free WiFi. Greeted by friendly, helpful staff. Upon entering our room, we were amazed how big the space was, by using a Murphy bed it allowed space for a lounge area. Separate toilet is always a positive and the bathroom was well appointed, however, the step into the bath to use the shower was quite high. We were pleased to have a kitchenette as we were able to buy pre-made meals from the supermarket and heat them, a nice change from eating out. Breakfast was included with our package and we found the selection plentiful and tasty, and the staff friendly. Secure entry into the building and lifts added to our feeling of safety. Finally, we found the Aparthotel Adagio’s perfect location suited our needs, close to sights, shopping and transport. Would highly recommend this hotel to travellers. Great concept. Very friendly and helpful staff. But apt not clean. Helpful and kind personnel, comfortable accommodation. I have stayed at this hotel many times, but I am not satisfied with the cleanliness. I also feel that the maintenance of the apartments needs to be made on a regular basis. It was my first time at Adagio GP and I absolutely enjoyed stayed there. The reception staff are friendly and responsive to all the requests/questions I had. The only issue I had was that the apartment was not cleaned for the duration I was there - 6 nights but I was made to understand that it is only cleaned only when the minimum stay is 8 nights. Cleaning of Room needs to be looked after. Corridor cleaning is very very bad. I am very much satisfied with my stay at adagio aparthotel. This time is not my first time staying at adagio. Perhaps my third or fourth time. If I am in Brussels, I prefer to stay at adagio. Firstly it has a very well furnished kitchen, where it is possible to prepare and eat my own food. Secondly, its proximity to the city centre and the shops makes it preferable for my stay. I have been staying at Adagio every time I pass by Brussels for the past 5 years. I really enjoy the comfort and location of the apartments, and the friendliness of the staff there. The rooms are comfortable and very well equipped. The staff are extremely professional and friendly. The hotel security is of high standards. The hotels provides all other useful services upon request. I felt comfortable and safe in the hotel. Great staff.. Great location.. Great rooms..bit the beds need replacing! I've stayed here about 20 times already and I really enjoy the location and the staff are amazing. The only thing I would say that needs to be improved are the beds. The beds are fine for one person but a double bed for 2 is really uncomfortable. This hotel is really cool. Great ambiance . Loved the kitchenette. Not at all noisy as you find in some others. Garbage disposal is somewhat a problem though. It's not always that you find the bins in the corridor. I liked the kindness of the staff at the reception and the location of the hotel. The staff at the reception was very kind and helpful. The location of the hotel is great. The corridor on the floor seemed dirty. The room could have been cleaner. In the bath and the sink the water was accumulating while using them. Having this in mind the price of the studio seems expensive. I'm returning customer, since I like the location of the hotel but didn't like the room with window towards the shopping centre (next time I will explicitely insist on room with window towards Anspach). Otherwise, the rest is ususal good quality that I'm use dto.